How many calories in Squid? We provide you with the Squid calories for the different serving sizes, Squid nutrition facts and the health benefits of Squid to help you lose weight and eat a healthy diet. Squid, like Octopus, have four pairs of arms. They are considered a mollusc, and the majority of the creature is edible. Squid are often sold as calamari, but if you are on a weight loss diet, you should avoid fried calamari. Squid provides an excellent source of copper. In addition, Squid provides a good source of vitamins B1-B3, B5, B6, B12, phosphorus, potassium, zinc and selenium, as well as other vitamins and minerals. They are very low in fat and contain a good amount of protein. However, they are high in cholesterol, even higher than Shrimp. A 100g serving contains more than three quarters of the daily recommended intake of cholesterol. 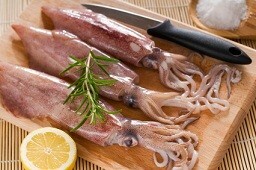 Squid contains omega-3 fatty acids. They are thought to help lower our blood pressure and help boost our immune system. Other health benefits of squid are believed to include reducing the pain associated with arthritis. Compare calories in Squid with the other calories in seafood.